"This vessel was originally designed as a hunter-killer, with many unique capabilities. It is a very special ship. It has had very special owners.."
— O-66, regarding to Scimitar. The Scimitar, also known as the Sith Infiltrator, was a heavily modified Star Courier and the personal starship of William Kurz. 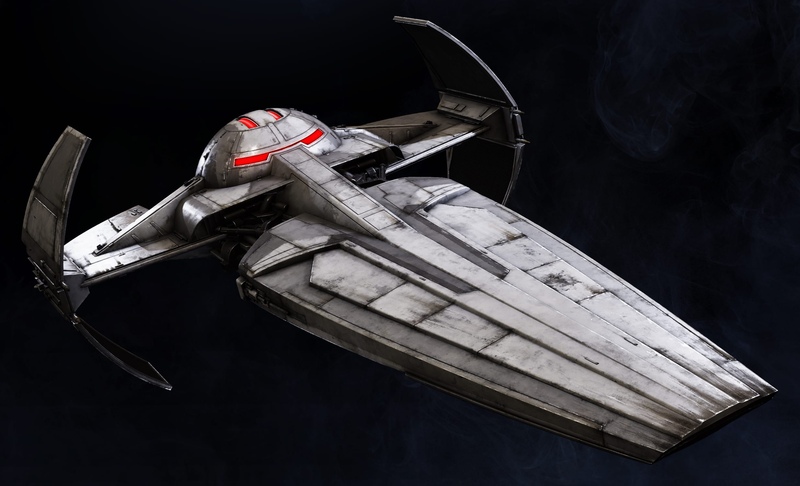 The Sith Infiltrator featured folding wings around its circular cockpit, and was secretly modified from a Star Courier manufactured by Hypori Drive Yards. The craft featured six laser cannons, a proton torpedo launcher and a minelayer. Along with its deadly armament, the Scimitar was equipped with a cloaking device that allowed it to disappear from view and any pursuing ship's sensors. Owing to the craft's experimental ion engines, radiator fins on the ship's wings were required to be open during flight in order to expel excess heat. The ship carried three DRK-1 Dark Eye probe droids, Bloodfin, a William Kurz speeder, and six B1-T reinforced battle droids. The Scimitar was capable of tracking a ship's signature through hyperspace, something considered impossible for other ships.